1,002 cattle came under the hammer last week at Clogher Mart with a good steady demand reported in all sections. In the fatstock ring beef cows sold to £1,484.20 for an 820kg Limousin at £181 per 100kg followed by 720kg Limousin at £1,375.20, £191 per 100kg and selling to a top of £192 per 100kg for a 670kg Limousin at £192 per 100kg (£1,286.40). Cow heifers sold to £1,113.60 for a 580kg Belgian Blue £192 per 100kg and reaching £200 per 100kg for a 520kg Limousin at £200 per 100kg. Fleshy Friesian cows sold to £130 per 100kg. Fat bulls to £1,676.40 for a 1,270kg Hereford at £132 per 100kg and selling to a top of £157 per 100kg for a 970kg Parthenais (£1,522.90). Overage steers to £173 per 100kg. Underage steers to £200 per 100kg. Underage beef heifers to £225 per 100kg for a 700kg Limousin. Leading prices in fatstock ring for beef and cows heifers as follows: Magheraveely producer 520kg Limousin to £200. Clogher producer 670kg Limousin to £192 (£1,286.40). Carnlough producer 580kg Belgian Blue to £192 (£1,113.40), 700kg Belgian Blue to £174 (£1,218) and 530kg Aubrac to £172. Beragh producer 720kg Limousin to £191 (£1,375.20). Armagh producer 630kg Limousin to £188 and 590kg Limousin to £182. Omagh producer 610kg Hereford to £184. Kesh producer 820kg Limousin to £181 (£1,484.20) and 650kg Limousin to £176. Omagh producer 550kg Limousin to £178. Dungannon producer 770kg Charolais to £177 (£1,362.90). Cookstown producer 680kg Limousin to £175. Omagh producer 630kg Limousin to £175. Newtownstewart producer 660kg Limousin to £174. Magheraveely producer 610kg Limousin to £173. Greencastle producer 680kg Limousin to £172 and 700kg Limousin to £171. Other quality lots sold from £140 to £168 per 100kg. Second quality lots sold from £118 to £136 per 100kg. Well fleshed Friesian cows sold from £124 to £130 per 100kg. Plainer lots sold from £84 to £113 per 100kg. Poorer types sold from £50 to £78 per 100kg. Maghera producer 970kg Parthenais to £157 (£1,522.90), 1,070kg Simmental to £140 (£1,498) and 930kg Limousin to £136 (£1,264.80), Craigavon producer 1070kg Charolais to £147 (£1,572.90), Aughnacloy producer 910kg Limousin to £145. Cookstown producer 900kg Simmental to £137. Newry producer 1,090kg Charolais to £135. Rosslea producer 1,270kg Hereford to £132 (£1,676.40). Omagh producer 940kg Limousin to £131. Florencecourt producer 810kg Charolais to £130. Omagh producer 920kg Charolais to £130. Caledon producer 850kg Holstein to £121 (£1,028.50). Omagh producer 750kg Ayrshire to £101. 550kg Belted Galloway to £173. 570kg Aberdeen Angus to £171. 490kg Charolais to £150. 820kg Limousin to £135. 670kg Holstein to £134. 910kg Simmental to £123. 530kg Charolais to £110. 500kg Charolais to £200. 580kg Charolais to £200. 600kg Aberdeen Angus to £183. 480kg Simmental to £172. 530kg Simmental to £170. 670kg Normande to £160. 560kg Fleckvieh to £160. 530kg Charolais to £160. 560kg Hereford to £160. 490kg Simmental to £160. 610kg Shorthorn to £157. 520kg Friesian to £150. 700kg Limousin to £225. 450kg Limousin to £208. 530kg Limousin to £195. 540kg Charolais to £192. 570kg Limousin to £192. 540kg Limousin to £186. 530kg Simmental to £180. 460kg Aberdeen Angus to £172. 560kg Friesian to £169. 550kg Hereford to £166. 580kg Holstein to £126. 550kg Holstein to £120. 470kg Holstein to £118. 400kg Friesian to £117, 450kg Friesian to £110. A seasonal entry sold to a steady demand with forward lots sold to £1,360 for a 640kg Charolais (£212.50), 680kg Charolais to £1,300, 700kg Charolais to £1,300, 650kg Charolais to £1,270, 600kg Limousin to £1,265, 620kg Charolais to £1,260, 640kg Charolais to £1,240, 590kg Charolais to £1,235, 620kg Charolais to £1,205 and 610kg Charolais to £1,155. For H Robinson, Portadown. B Frazer, Lisburn 700kg Limousin to £1,335 and 690kg Charolais to £1,200. W J Parkes, Lurgan 580kg Limousin to £1,240, 680kg Charolais to £1,200 and 640kg Charolais to £1,200. A T Fiddis, Derrygonnelly 570kg Charolais to £1,205. F McStay, Lurgan 540kg Charolais to £1,145. W Richardson, Dungannon 630kg Limousin to £1,160. B Connelly, Trillick 620kg Limousin to £1,150 and 610kg Simmental to £1,145. F McStay, Lurgan 480kg Charolais to £965, 450kg Charolais to £930, 460kg Charolais to £900, 450kg Blonde d’Aquitaine to £900, 460kg Charolais to £900, 460kg Limousin to £885 and 480kg Simmental to £870. R G Cummings, Killylea 480kg Aberdeen Angus to £960. Coalisland producer 460kg Limousin to £950. R M Richmond, Aghalane 470kg Hereford to £950 and 460kg Hereford to £840. E J McDaid, Beragh 410kg Limousin to £950 (£231) and 450kg Limousin to £855. A C Kearney, Downpatrick 500kg Limousin to £940, 450kg Limousin to £940 and 430kg Blonde d’Aquitaine to £825. Coalisland producer 400kg Limousin to £880 and 390kg Limousin to £850. C Stewart, Fivemiletown 330kg Limousin to £620 and 310kg Hereford to £470. J Gillespie, Killylea 340kg Fleckviehto £530. A brisk demand in this section with strong stores selling to £1,310 for a 610kg Limousin (£211) and a 530kg Limousin to £1,080 for M/S L and K O’Donnell, Coalisland. K P Donnelly, Stewartstown 590kg Limousin to £1,190 and 570kg Simmental to £1,060. G McKenna, Caledon 640kg Charolais to £1,170. D J W Kettyle, Newtownbutler 550kg Limousin to £1,100. C McCombe, Clogher 530kg Aberdeen Angus to £1,040, 510kg Limousin to £920 and 510kg Aberdeen Angus to £850. A Gribben, Portadown 500kg Charolais to £910. A C Kearney, Downpatrick 480kg Charolais to £1,040. K and A Clarke, Tynan 470kg Simmental to £1,035 (£220), 460kg Aberdeen Angus to £900, 410kg Simmental to £770 and 440kg Charolais to £760. D Beattie, Newtownbutler 460kg Simmental to £900. C McCombe, Clogher 450kg Aberdeen Angus to £855, 480kg Hereford to £810, 460kg Hereford to £800 and 460kg Simmental to £790. N and D Black, Cookstown 420kg Simmental to £820. Scott and Ewing, Omagh 430kg Limousin to £800. P Brannigan, Dungannon 430kg Charolais to £775. J Redmond, Loughgall 380kg Limousin to £865, 390kg Charolais to £830, 380kg Charolais to £810 and 380kg Charolais to £670. M/S I E and E S Johnston, Cookstown 370kg Limousin to £830. K and A Clarke, Tynan 400kg Charolais to £790. N and D Black, Cookstown 370kg Limousin to £700, 390kg Limousin to £660 and 330kg Limousin to £625. C McCombe, Clogher 400kg Limousin to £700. P Hackett, Augher 340kg Belgian Blue to £620. S Fletcher, Caledon 350kg Aberdeen Angus to £610. A firm demand in this section with steers and bulls selling to £995 for a 410kg Charolais (£242), 340kg Charolais to £850 (£250) and 370kg Charolais to £840 (£227) for R and S Black, Cookstown. J McElroy, Clogher 400kg Charolais to £955 (£237), 310kg Charolais to £865 (£277) and 360kg Saler to £820 (£228), R E Wilson, Trillick 500kg Charolais to £950 and 470kg Charolais to £825. E Kelly, Augher 400kg Limousin to £950 and 390kg Limousin to £900. B McKeever, Armagh 400kg Limousin to £940 and 350kg Charolais to £890 (£254), Walter Hogg, Fivemiletown 350kg Charolais to £920 (£263) and 330kg Charolais to £830 (£252), G and G Warrington, Rosslea 340kg Charolais to £890 (£262), M J Teague, Omagh 370kg Simmental to £875 and 440kg Simmental to £840. O P Donnelly, Augher 360kg Simmental to £845. R Watson, Fivemiletown 450kg Simmental to £840. T Armstrong, Ballinamallard 470kg Charolais to £1,000 (£212), E O’Hagan, Eskra 430kg Charolais to £985 and 420kg Charolais to £930. C Johnston, Fivemiletown 340kg Limousin to £840 (£247), C McDonald, Ballygawley 440kg Limousin to £800, 410kg Charolais to £765 and 390kg Limousin to £700. E Kelly, Augher 330kg Limousin to £800 (£242), P Prunty, Tempo 390kg Charolais to £800 and 380kg Charolais to £755. G McCaughey, Clogher 360kg Charolais to £755. J Cassidy, Rosslea 320kg Limousin to £755, 270kg Limosuin to £705 (£261) and 320kg Limousin to £700. M O’Kane, Cookstown 330kg Blonde d’Aquitaine to £750, 310kg Limousin to £720 and 280kg Limousin to £680. Walter Hogg, Fivemiletown 330kg Charolais to £710. Dungannon producer 350kg Simmental to £700. R J Barnes, Cookstown 340kg Limousin to £690. A brisk demand this week with a Fivemiletown producer selling calved heifers to £1,680 and £1,620. R Givan, Dungannon £1,530 for calved heifer. K Rooney, Newry £1,440 and £1,280 for calved heifers. Ballygawley producer £1,250 and £1,200 for calved heifers. R and E Johnston, Tempo £1,180 for calved heifer. Others sold from £895 young maiden heifers sold from £410 to £450 for a Castlederg producer. A large entry this week sold to a steady demand with M B Tracey, Gortin selling a heifer and bull calf to £1,600. Ed McCann, Fintona £1,565 for heifer and bull calf. G McCaughey, Clogher £1,540 for second calver and heifer calf and £1,315 for third calver and bull calf, M/S D and F Anderson, Irvinestown £1,400 for 2012 cow and bull calf and £1,315 for heifer and heifer calf. J McCullagh, Sixmilecross £1,390 for 2008 cow and bull calf. D Herron, Coalisland £1,300 for heifer and twin calves. M Mullan, Augher £1,300 for second calver and bull calf and £1,130 for heifer and heifer calf. I Allen, Armagh £1,270 for 2008 cow and bull calf and £1,220 for third calver and bull calf. B McStravick, Aghagallen £1,255 for heifer and bull calf and £1,230 for 2012 cow and bull calf. S McCann, Sixmilecross £1,240 for heifer and bull calf and £1,220 for heifer and heifer calf. A large entry last week sold easily to a very keen demand with bull calves (under two months) selling to £510, £455 and £425 for Charolais to C McVitty, Newtownbutler. D O’Hagan, Maghera £465 for Charolais. E and A Thompson, Tempo £440 for Simmental. J Turkington, Lurgan £420 and £390 for Aberdeen Angus. M Breen, Tempo £395 for Belgian Blue. W S Little, Lisbellaw £390 twice and £330 for Limousins. P A and J Grue, Lisnaskea £365 and £330 for Charolais. H Maguire, Trasna £355 for Aberdeen Angus. D and J Hunter, Tempo £340 and £335 for Charolais. R Moore, Drumlone £335 for Belgian Blue. Clogher producer £540 for Limousin and £485 for Charolais. C McVitty, Newtownbutler £455 for Charolais and £345 for Belgian Blue. Aughnacloy producer £435, £430 and £420 twice for Limousins. Omagh producer £410, £400, £390 and £380 for Charolais. B McCullagh, Greencastle £610 for Limousin. O P Donnelly, Augher £570 for Simmental. J Duffy, Greysteel £560, £555, £530 and £505 twice for Fleckviehs. W Hogg, Fivemiletown £550 for Limousin. S Hill, Carrickfergus £530 for Charolais. C McVitty, Newtonbutler £510 for Charolais. Augher producer £500 for Saler. K McCrumlish, Omagh £495 for Limousin. E and A Thompson, Tempo £480 for Hereford. N Taggart, Aughnacloy £460 for Belgian Blue. K Acheson, Dromore £630 for Charolais. B McCullagh, Greencastle £585 for Charolais. Augher producer £540 for Limousin. S McElroy, Clogher £540 for Charolais. E and A Thompson, Tempo £530 for Belgian Blue, £500 for Simmental £498 and £460 for Hereford. 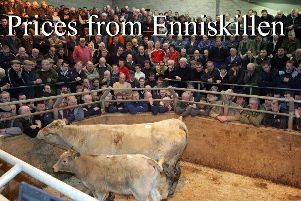 Dungannon producer £485 for Limousin £485 for Charolais £475 and £375 for Simmentals. P Mullan, Dungannon £475 and £430 for Shorthorns. P Brannigan, Dungannon £450 and £410 for Charolais.